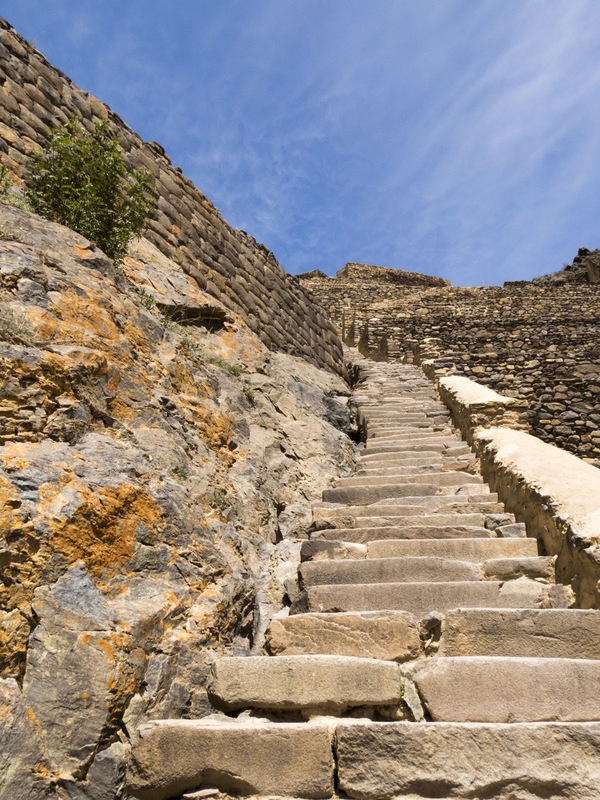 Ollantaytambo is the gateway to Machu Picchu for many visitors to the Sacred Valley of Peru. 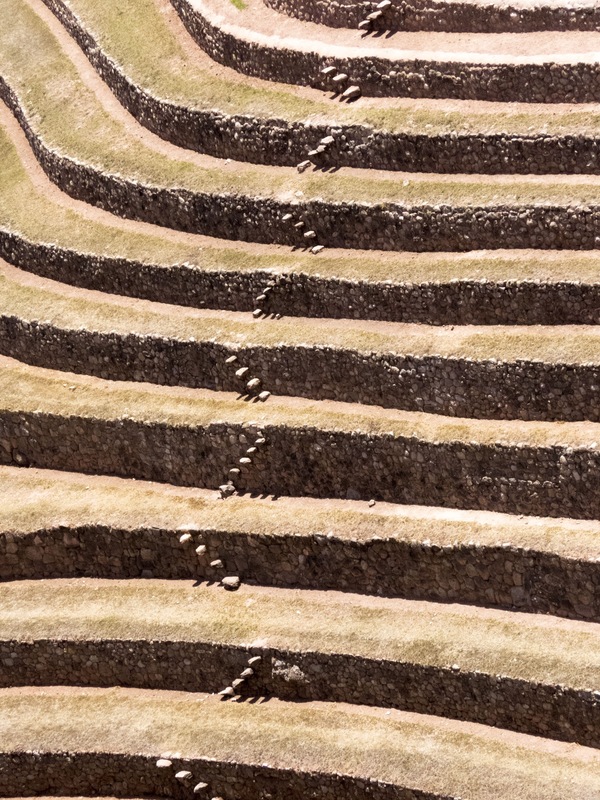 Why should you stay in Ollantaytambo instead of other places in the Sacred Valley? 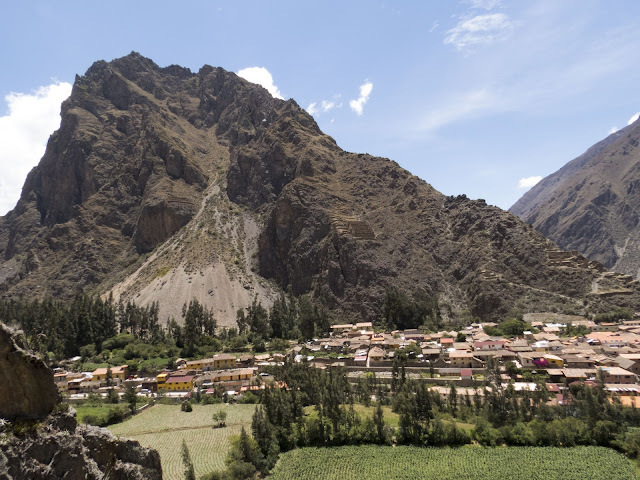 Surrounded by jagged peaks, Ollantaytambo offers a combination of a reasonable altitude, stunning Incan ruins plus quaint restaurants and shops. 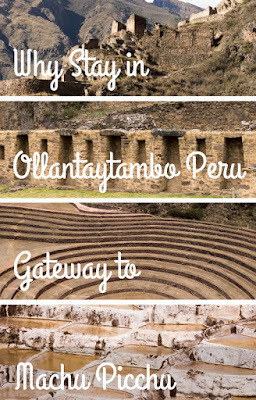 Read on to learn more about cool things to do in and near Ollantaytambo (aka Ollay as locals call it). Cusco, home to the major international airport closest to Peru's Sacred Valley, sits at 3400 m (over 11,000 feet above sea level). If you live at lower altitude, a visit to Cusco will take your breath away. Literally. Anytime you travel to a place higher than 8000 ft above sea level, altitude sickness is a real risk. Ollantaytambo is about a 2 hour ride by taxi from Cusco and is situated at a more reasonable 2800 m (about 9200 ft) above sea level. You'll still need to acclimate but the impact of the altitude will be much less severe than in Cusco. Spend three days in Ollay to acclimate to the altitude. Sip coca tea (typically available at hotels throughout this region of Peru) and take slow walks through the level streets of the town to get used to the lower oxygen levels and thinner atmosphere. What To See in Ollantaytambo? 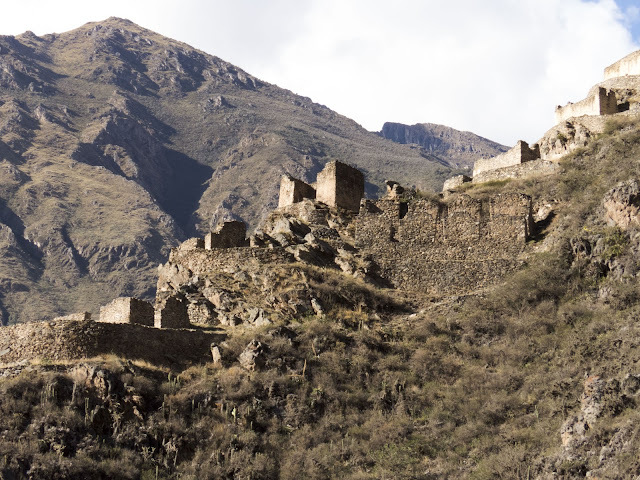 Three days in Ollantaytambo may sound like a long time, so what is there to do here? Surprisingly, the small town of Ollantaytambo is home to a branch of Peru's ChocoMuseo. Other locations can be found in much larger cities like Lima and Cusco. We booked in for a 2 hour bean-to-bar course. The day that we visited, ChocoMuseo's English guide was sick. We speak only a very little Spanish but agreed to do the workshop in Spanish. Between our host Marisol's broken English and our poor Spanish, we managed to communicate (with a healthy dash of smiles and gestures mixed in, of course!). We got to do it all. We started by roasting the cocoa beans and then grinding the cacao. Marisol even showed us how to make tea with the cacao shells. We made two kinds of hot chocolate with the beans that we'd shelled and ground by hand: Maya hot chocolate with chili and honey and conquistador hot chocolate with cloves, cinnamon, and hot milk. 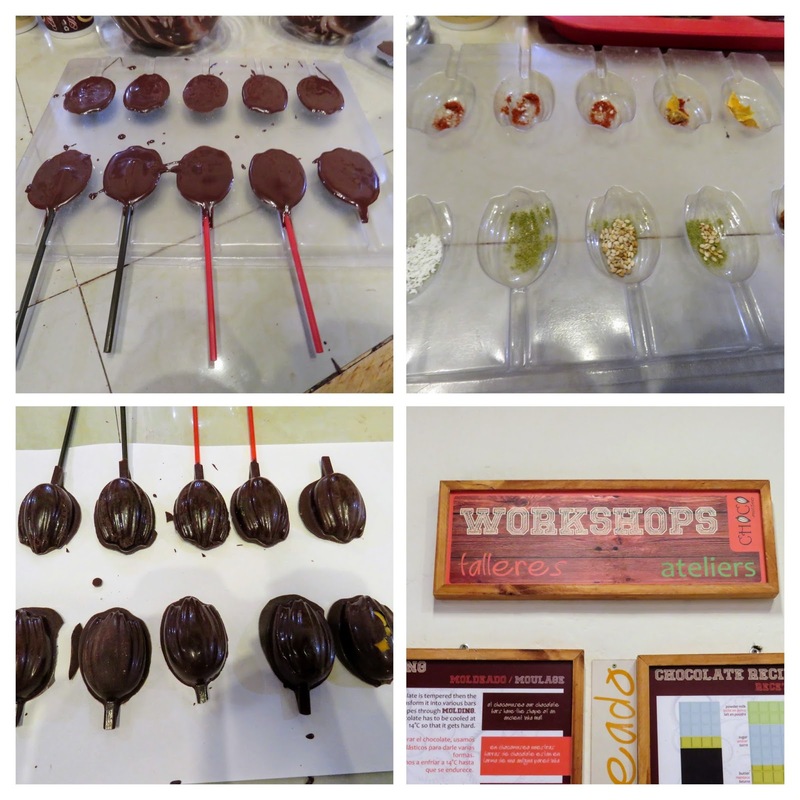 Marisol presented us with silky smooth molten chocolate, a wide selection of ingredients to add, and molds to put them in. The mix-ins for the chocolate included the usual suspects like nuts and dried fruit but also some uniquely Peruvian options like Maca and Coca powder. We even added some chili to pack a punch. Overall, the ChocoMuseo is a lovely way to spend an afternoon on your first day in Ollantaytambo when you're at your most vulnerable to altitude sickness. It's not strenuous at all and the fun of making chocolate will help take your mind off any shortness of breath. The ChocoMuseo workshop is also the gift that keeps on giving. We took our chocolate back to the hotel with us and enjoyed it for the next two weeks while we were on the road (sampling 1-2 pieces per day). Ollantaytambo features a number of small shops selling the usual tourist tack. However, we also discovered Awamaki store which sells fair trade crafts made by local artisans. Here you'll find items woven from both sheep's wool and from alpaca. Definitely worth checking out. Casually browsing for souvenirs is another good first day in Ollay activity as you adjust to the altitude of Peru's Sacred Valley. Machu Picchu is certainly the star attraction in the Sacred Valley of Peru but Ollantaytambo also boasts an impressive collection of Incan Ruins. I'd recommend saving the Ollaytaytambo ruins for your second or third day in Ollay. The ruins cling to the hillside and there are a lot of steep steps to climb on the site. 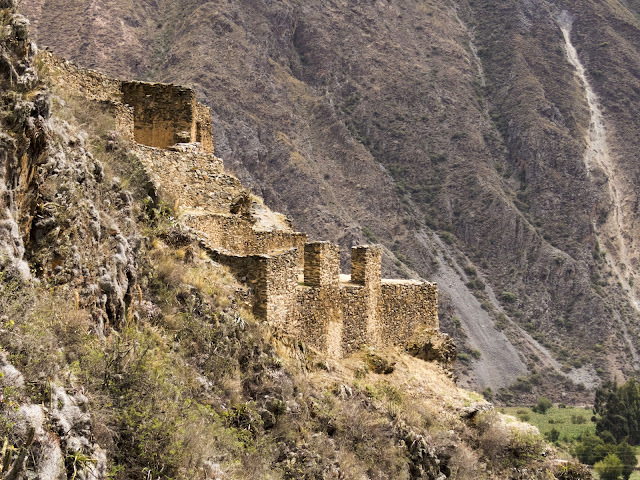 Ollantaytambo ruins are definitely on the tour bus circuit but by staying in Ollay, you can visit the ruins early and beat the crowds. We practically had this well-preserved archeological site all to ourselves. 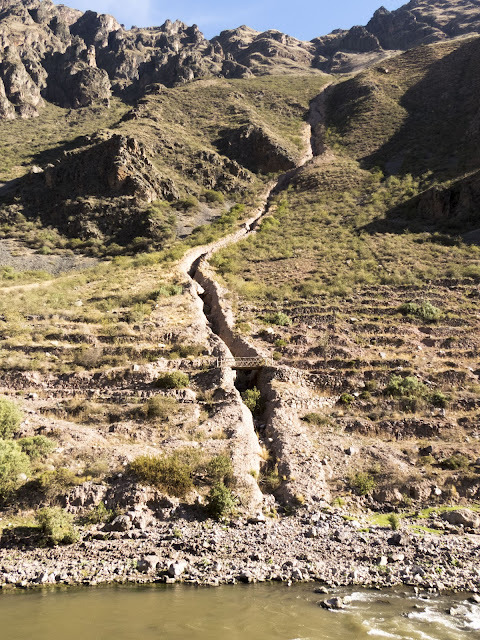 The Pinkuylluna ruins in Ollantaytambo are located up a narrow and fairly harrowing trail. The path to Pinkuylluna is more challenging to find but your hotel can point you to the starting point. We set out toward Pinkuylluna with good intentions of hiking all the way to the ruins. The trail was difficult to follow and the hiking path quickly got steep and rocky with fewer handholds. We didn't want to risk breaking an ankle before our visit to Machu Picchu so we decided to turn back. We did enjoy breathtaking views of the Pinkuylluna ruins and indeed the entire town of Ollantaytambo from our vantage point halfway up the hill. Check it out. Maybe you'll make it further than we did. Ollantaytambo is also a great spot for birdwatching, an activity that's not too strenuous and amenable to time spent acclimating to the altitude in the Sacred Valley. 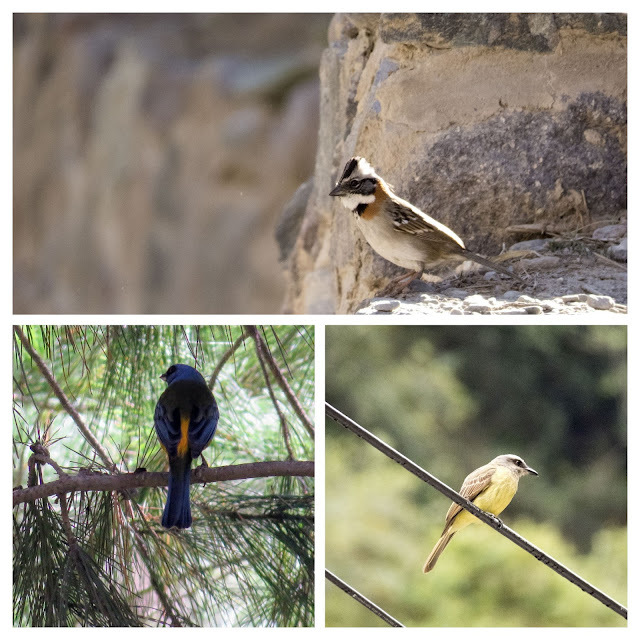 We saw amazing birds everywhere we went in Ollay including along the river and in the idyllic gardens around our hotel. We even spotted a giant hummingbird, the largest species of hummingbird in the world, feeding on wildflowers peeking out from the cliffs at the Ollantaytambo ruins. The Urubamba River snakes through Peru's Sacred Valley and passes right through Ollantaytambo. Take a walk along the river for stunning scenery. You'll see some birds and even wildlife, or at the very least livestock, feeding in the river. Be careful if you walk along the dirt road along the Urubamba River. There is not a lot of traffic but when cars do pass, they do so quickly and kick up a lot of dust. 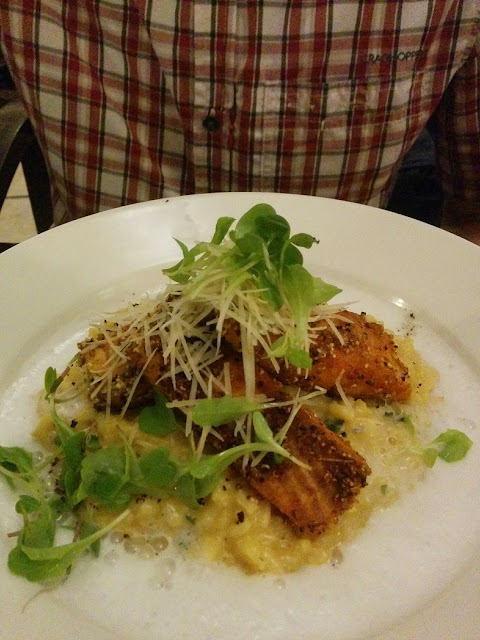 Great places to eat are also high on our wishlist things we look for when choosing a place to stay. Ollantaytambo offered a variety of options to eat and pass the time while acclimating to the altitude in Peru's Sacred Valley. 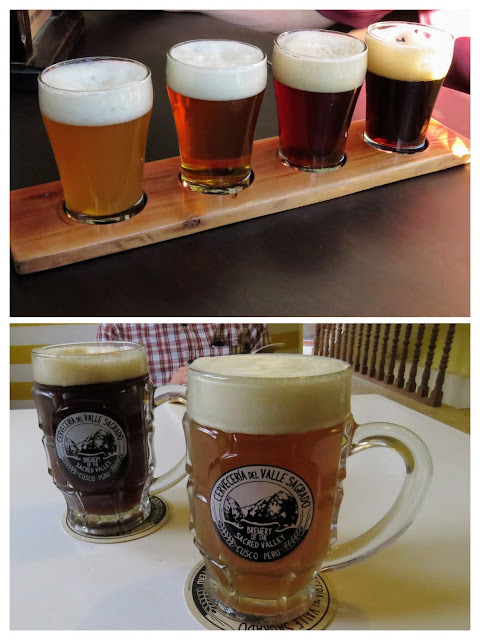 We passed the brewery and tasting room of Cervecería del Valle Sagrado on the trip between Cusco and Ollantaytambo. If you don't have your own car, it's difficult to get here though and the brewery is not the easiest to walk to. We opted to try craft beers from Cervecería del Valle Sagrado in Ollantaytambo town at the train station cafe, an atmospheric eatery where you sit on dark paneled benches in a patch of sunshine and watch tourists coming to and fro as they board the train to Aguas Calientes, the final stop before Machu Picchu. We enjoyed Cervecería del Valle Sagrado beers so much that we grabbed a pint on a different day at Sunshine cafe, a small coffee/lunch shop run by an American expat. 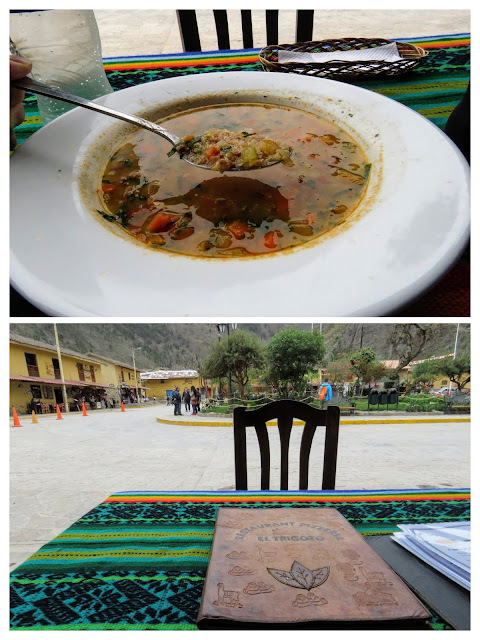 Plaza Ollantaytambo is surrounded by casual restaurants where you can grab a bite to eat and dine al fresco. It's a good idea to eat light on your first day in Ollay to avoid complications related to altitude sickness. We sipped quinoa soup which is packed with protein but easy to digest. Peru is known for seafood but when you visit the Sacred Valley, leave the ocean fish behind, it just won't be fresh (especially by Peruvian high standards) when it has to travel so far. Instead, turn to Trucha (river trout) as a delicious alternative that you'll only find in Cusco and the Sacred Valley. 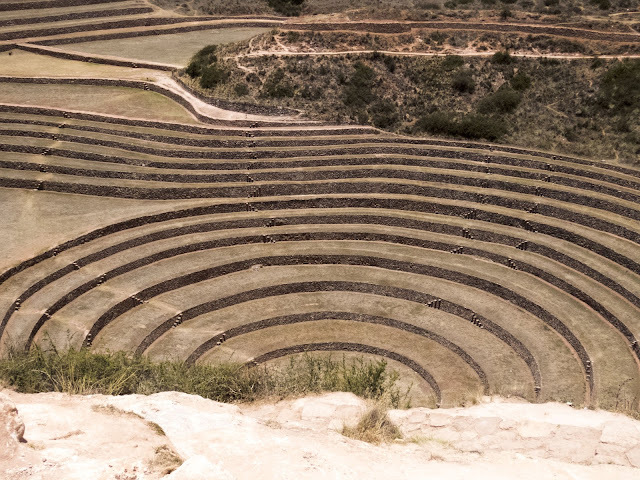 Ollantaytambo is also conveniently situated for day trips around the Sacred Valley in Peru. For many people, Machu Picchu is the reason they decide to visit Peru in the first place. There is a non-stop train from Ollantaytambo to Aguas Calientes, the closest train station to Machu Picchu. 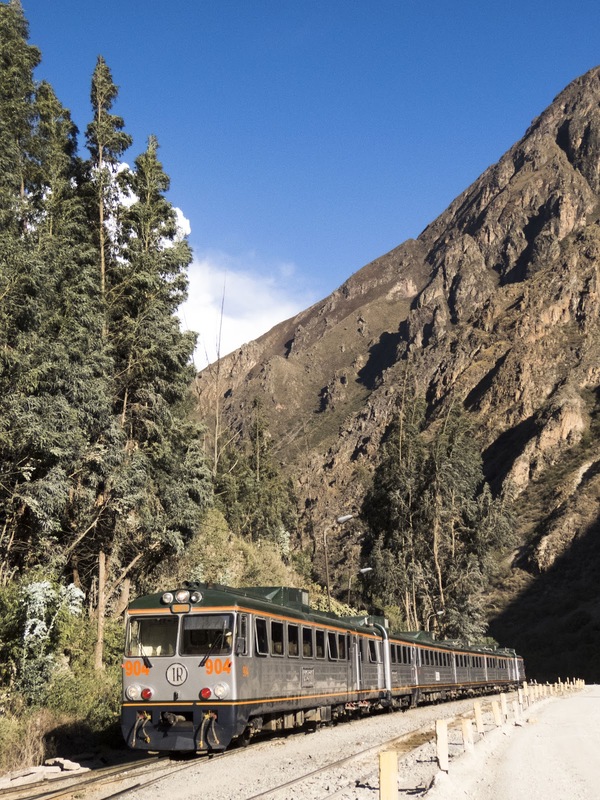 By staying in Ollantaytambo, you'll be well-positioned to catch your train. We caught the train in Ollay, taking just an overnight bag with us and leaving the rest of our luggage with our hotel. Our Machu Picchu permit was for the morning. We arrived the night before, stayed at a hotel in Aguas Calientes and then boarded the bus to Machu Picchu around 5:30 am the next morning. We had a magical visit exploring the pinnacle of Incan construction until around noon and then took the train back to Ollantaytambo. As of earlier in 2017, tickets to Machu Picchu are for a half day only. Some visitors report that as long as they don't leave the complex, they are alowed to stay all day. The main issue then becomes: how strong is is your bladder. Toilets at Machu Picchu are only located outside of the ticket gate (and note, you'll be charged to use the facilities). Another day trip from Ollantaytambo involves taking a taxi to visit Maras and Moray. We hired the taxi through our hotel to take us to both places (about 6 hours in total) for $65 USD. Pro tip, if your taxi ends up being a larger van like ours was (sent by design to make the ride less bumpy), sit in front with the driver so you can take pictures out the window. The windows in the back of the van did not open and there is plenty to photograph along the way! 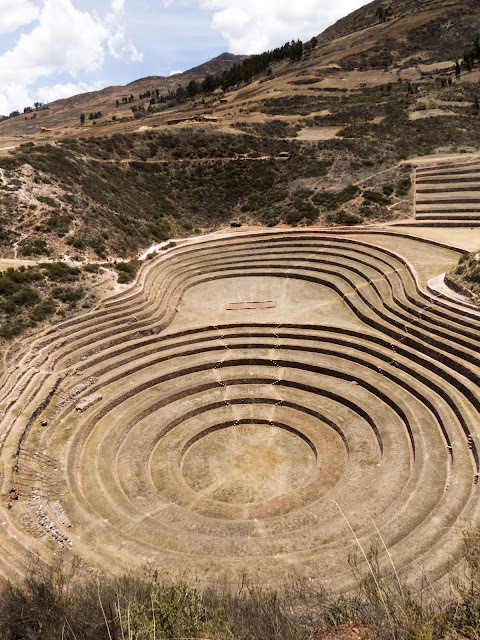 Our first stop was Moray, or what I like to think of as the Incan Farm Laboratory. Concentric, stepped circles jump out from the landscape. 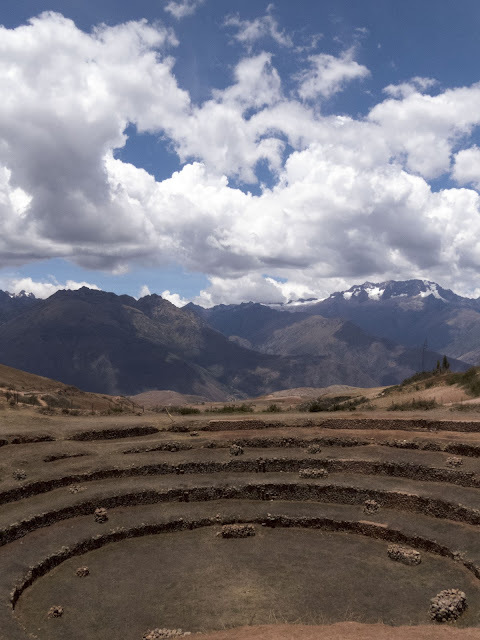 The Incans used these circles to plant different crops and test how well they grew at different altitudes. I love to think of the Incas as methodical medieval scientists. I can just imagine chicha (corn), and 3000 different kinds of potatoes being planted to test how different crops would do. In reality, science meets beauty at Moray. The site is incredibly picturesque. The concentric circles that make up the Moray historic site are extremely well-preserved in sections. You'll start your visit from above and then descend along a trail that runs around the main bowl. Old stone staircases, connect the agricultural plots. Note that Moray is actually higher in altitude than even Cusco so you will likely feel it. We only visited for an hour or so but the climb back up after trekking down to the lip of the crop circles was tough. The view may have taken my breath away but so did the altitude. We brought some coca candy with us which seemed to help a little (although it may have just been a placebo effect). Either way, we figured it couldn't hurt to have some coca candy on hand in case the altitude started to affect us. The second stop on our day trip from Ollantaytambo was to Salineras de Maras, a historic Incan salt mine. For over 500 years water from the mountains has dripped into these catch pans created by the Incas. 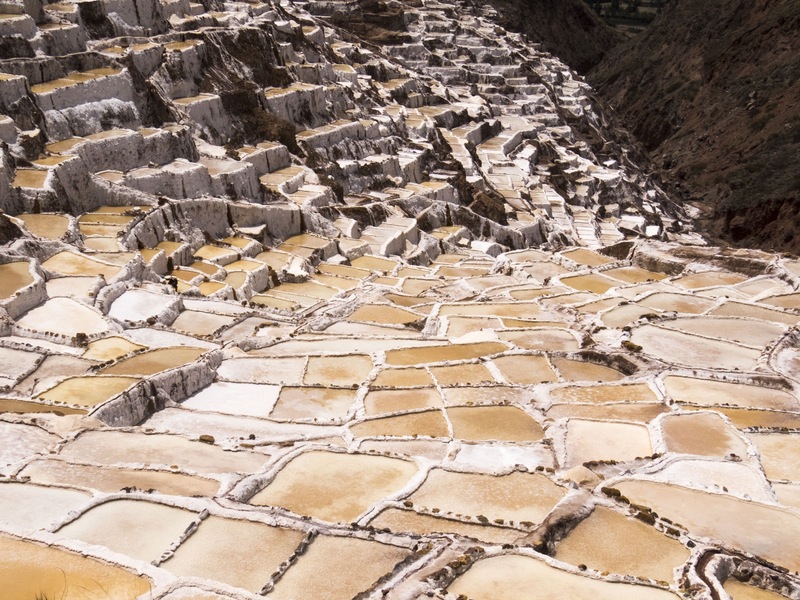 Why is the water at Salineras de Maras salty when the site is located so far from the sea? The water than drips into the salt pans comes from an underground natural spring which then mixes with salt deposits from ancient lakes. We carefully picked our way along the very narrow trails lining the salt beds. We watched strong young men harvest the salt by shoveling the sun-dried crystals into 50 pound bags. 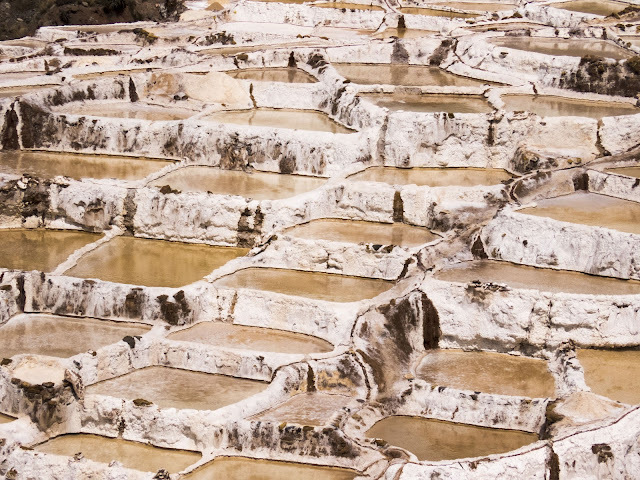 It was clear that mining salt at Salineras de Maras is extremely hard work. On site, vendors sell small bags of Peruvian pink salt for just 1 sol (about 30 cents in USD at the time of writing). It blows my mind that something so labor intensive to produce can be so inexpensive. 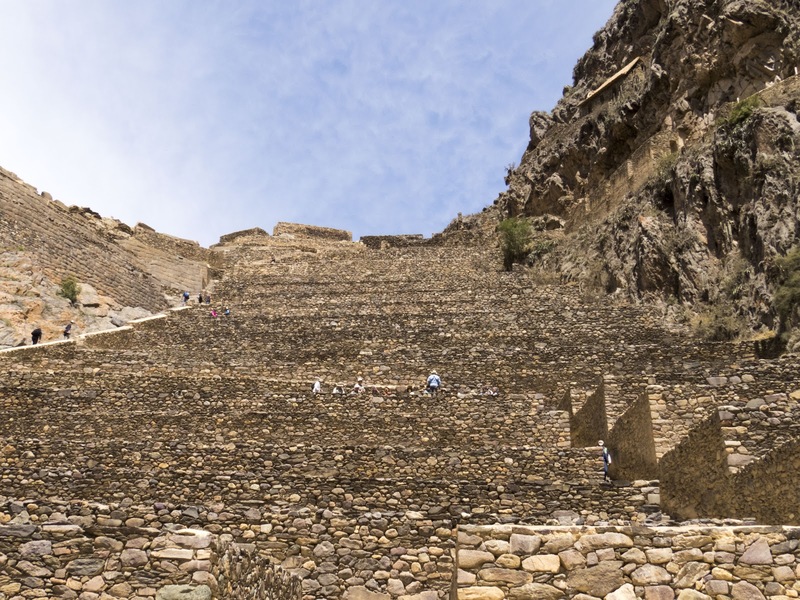 What's the best way to get to Ollantaytambo? For peace of mind, we arranged for a private airport transfer from Cusco to Ollantaytambo for $50 USD. The price seemed reasonable given that we were two people and the drive was nearly 2 hours. On our return to Cusco, we opted to use Taxidatum. Taxidatum can be booked through an online form and we found that they provided a reliable service when we used the company on our visit to Lima. For $37 USD, the took us from our hotel in Ollantaytambo to our hotel in Cusco, again, about a two hour drive. Speaking of hotels, where should you stay in Ollantaytambo? We chose Hotel Samanapaq which cost about $120 USD (about $60 USD per night). Hotel Samanapaq is located on the outskirts of Ollay but is walking distance to the center of town in less than 10 minutes. The hotel is situated in a lovely garden setting and is a great place to relax and maybe do a bit of birdwatching while you acclimate to the altitude. If you've made it this far, I'm sure you'll recognize why Ollantaytambo is a great place to stay when visiting the Sacred Valley of Peru. Acclimate to the altitude in a relaxing setting in a great location with plenty of cool things to do, see, and eat in Ollay. Urubamba is probably the most popular place to stay in the Sacred Valley especially if you are on a group tour. 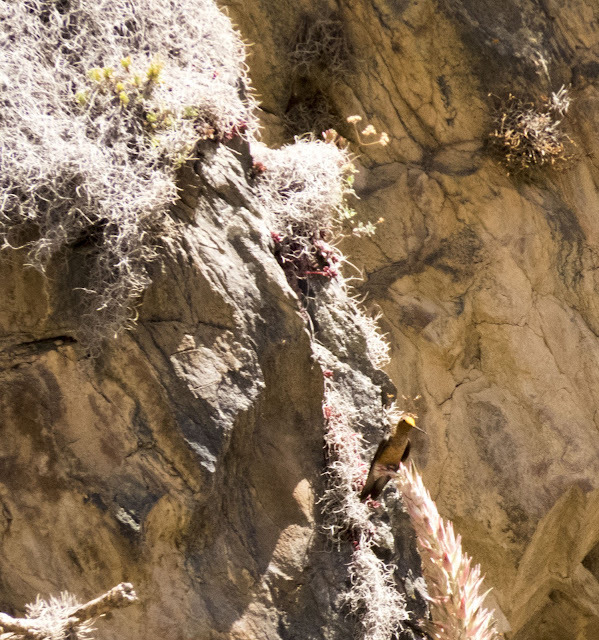 Why choose Ollantaytambo over Urubamba as your home base in the Sacred Valley? Urubamba is certainly a bigger city with more hotel choices and is a shorter drive from Cusco. Still, we decided to pass by Urubamba in favor of the quiet, relaxed atmosphere in Ollay. We loved that we could walk everywhere with no worries. Staying in Ollantaytambo also ensured that we got first dibs on the Incan Ruins there before the bus tours rocked up. Learn about why you should stay in Ollantaytambo as a home base on a trip to the Sacred Valley of Peru. This post shares cool things to do in and around the Gateway to Machu Picchu.